If you are a cricket lover and want to be updated with the latest stories of the cricket, Prateek’s blog crickettoast.com is the best place for insider buzz and latest news of the cricket. Prateek and I have been talking for the past few weeks after connecting on a Facebook group. 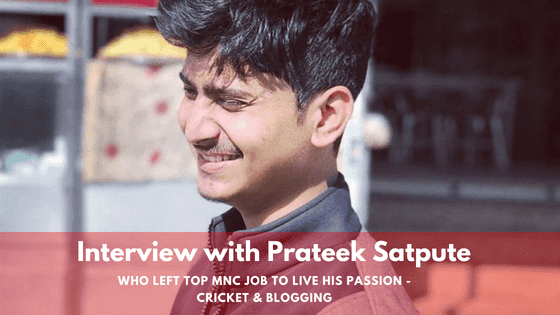 I thought it would be great to interview him to put some shed of light on what he is doing and find out more about his journey on a cricket blog. 1 Q: Can you tell our readers about yourself and your blog? 2 Q: Cricket is the top of religion in India, what are your thoughts on that? 3 Q: How did you feel when Dhoni resigned from his captaincy? 4 Q: What inspired you to start writing a blog on cricket? 5 Q: What’s your best advice for handling criticism? 6 Q: Would you like to say anything to cricket lovers who start trolling players after losing a match? 7 Q: What surprising lessons have you learned along the way of your blogging journey? 8 Q: What is the future of sports based blogging in India according to you? 9 Q: What’s the best advice you ever received? Q: Can you tell our readers about yourself and your blog? Hi Rakesh! I’m a bit surprised that you chose me to interview. But I’m more than happy to be here. Firstly, a big congratulations on your new blog! You are soon going to be a cricket guru for every kid who aspires to be a cricketer. but quit the job soon as it wasn’t something that I was looking in the long run. In April 2018 I started my blog- crickettoast.com. Simultaneously, I started learning and implementing Digital Marketing Techniques. Currently, I am working as a Digital Marketing Executive in a startup. Cricket Toast is all about providing cricket news and updates to the viewers. I am working on providing more and more unique content to the cricket followers. Q: Cricket is the top of religion in India, what are your thoughts on that? You rightly said this. Cricket is not just a sport in India but it is a religion. The madness and craze that people have for the sport is just mind-blowing. and now Virat Kohli and MS Dhoni. Indian fans are the best when it comes to supporting their country. One of those fans myself, I am a ridiculously passionate follower of Cricket! Q: How did you feel when Dhoni resigned from his captaincy? Firstly, it came as a shock to me. But then I thought that a person who has led Indian Cricket to achieve every ICC Title in his career has a much better thought-process than the rest of us. It was the right time for India to have a new leader whom Dhoni can guide while he still features in the playing XI. Q: What inspired you to start writing a blog on cricket? I have always been an avid follower of Cricket. I also write for sportskeeda as a Freelancer. I wanted to contribute to the audience with the cricket news, updates, and info. I know, there are hundreds of such blogs running. But Cricket Toast is something that I want to use as a medium to inspire people through cricket. I am working on the same and soon will be a regular segment of my blog. Q: What’s your best advice for handling criticism? I feel that criticism is one of the needed things in everyone’s life. Be it a positive or negative criticism. Positive criticism will definitely lift us up and inspire to work hard. But at the same time, one should not get demoralized through the negative feedback. One must be able to accept those flaws. It’s for our betterment and it really helps us to improve and sustain in the long run. Whenever we get a negative criticism, think for a minute if that really applies to you. If not, then you do not need to spend your precious time on this. Cricket teaches us the same thing. Players never pay attention to the untrue media news and criticism, but they tend to listen to the criticism from cricket experts. Q: Would you like to say anything to cricket lovers who start trolling players after losing a match? That’s the saddest part of Cricket (Indian Cricket to be specific). time we can win. Sometimes, the opposition plays better cricket and can outplay us. So we must back out team during their tough times. In the end, it is our cheer and support that boosts the team’s confidence. Q: What surprising lessons have you learned along the way of your blogging journey? for money aspect. Yes, the money will come in time if you keep on providing awesome content to your viewers. Q: What is the future of sports based blogging in India according to you? we can build a community where the sports followers can present their views individually. Through a blog, people are free to express whatever they wish to. Following this, I took an informed decision to quit the IT MNC job and start blogging. It was a very tough decision to take but I believed I myself to pursue blogging. It’s just the starting and I have a long way to go. I have fear in my mind daily but I use that fear to break through the difficult times and work with more perseverance.